All Frankie ever wanted to be was a clown. My theory is he was a repressed child, and so he didn’t enjoy those younger years and was always trying to get back to them. Being a clown gave him a way to do that. So I really believe it was as innocent as that at first. He’d offer his services at parties, but he always got a bit too energetic with the children. He wanted to be like them, play with them, not just entertain. And sometimes they’d get scared and cry and he’d apologise, but gradually, gradually, opinion turned on him, as opinions tend to do in small towns. People started to think he was up to no good. I don’t think that’s right. And I really don’t think what followed was right at all. How they vilified him. How they started to say his interest in children was suspect, prurient, maybe even abominable. First it just manifested as never being booked for parties anymore. Then he sadly tried to dress up and call children to play. That meant they sent the cops to him, and they weren’t subtle or gentle or understanding in the least. So Frankie ran away, into the woods. And in the woods something happened to him, something changed. He went from being suspected as a monster to kind of accepting it. Maybe it was revenge, or maybe he’d always been a bit simple in the head. But then the children started going missing, and there was hell to pay. Do I think he took the children? I kind of think he did, though it makes me sad to say it. I saw him once, just a bit before they caught him in the woods. He’d changed. he looked deranged. He looked kind of evil and kind of like he enjoyed it. Kind of like that was a stronger and better thing to be than needy. They never found the children, so we’ll never know for sure. But many in the town were sure anyway because it didn’t take much for them to be sure of anything. They had the wilful surety of the blind and bigoted. But maybe they were right. Maybe he was a monster. And maybe they created that, but we’ll never know. Frankie’s dead now. They took him down literally when they caught him. He wasn’t going without a fight. His last game, this time with adults, but he should have known. From them, and ultimately from himself – adults play the very, very worst games of all. 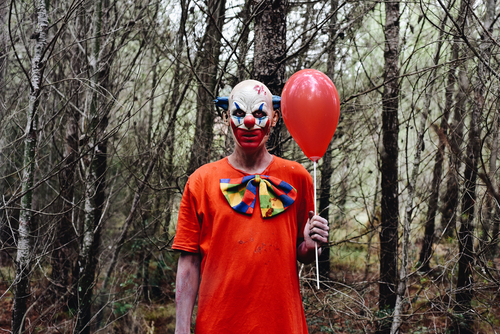 This entry was posted in Horror Flash Fiction and tagged child killer, children, clown, Horror, horror flash fiction, monster, parties, revenge, town gossip. Bookmark the permalink. Poor Frankie. Of course, that photo didn’t do him any favors.